We understand, in spite of our best efforts, there could be situations sometimes when you might think of asking for a rework or refund. Requests for either should be submitted within 03 (three) working days from date of submission of the completed assignment. Requests for rework cannot deviate from the initial scope. If additional work is involved, there will be additional charges. In case you wish to ask for a refund immediately after placing an order, that might be considered on a pro-rated basis as we pay our experts/writers in advance and not all our writers/experts are open to discussing refunds once an order has been placed with them. Cancellation charges, banking charges, transaction charges and penalties may also apply. If you have accidentally paid us more than the quoted amount, the excess amount will be refunded through the same mode of payment after deducting transaction charges, if any. Scores or grades for assignments are beyond our control and we do not make refunds because of lower-than-expected scores or grades. Our services are provided on a best-effort basis only and meant to assist our customers who are unable to do their assignments themselves, for whatever reason. We do not process refunds after submitting a completed assignment to our customers. But we may offer a rework or discount for a future order, purely on a case-to-case basis and solely at the discretion of our escalations team. For any other situations, please discuss with the Account Manager assigned to you. Please note, we reserve the right to ammend our refund policy from time to time without any prior notice to anybody. 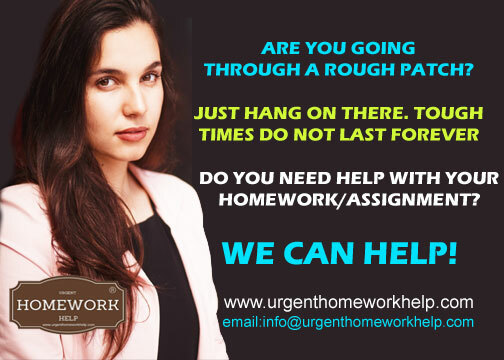 For any escalations, please email us at support@urgenthomeworkhelp.com along with your assignment/order number and a detailed description of the problem you faced. The escalations team will generally respond within 3 to 5 business days. You can also get in touch with us by phone - our contact numbers are mentioned on the top of every page. You can also leave a voicemail in case we are unable to take your call at that time. You can also chat with us on Google Hangout or Skype and tell us exactly what you need and when. Share any relevant documentation. Tell us if you would like us to follow any particular referencing style. How many words do you need your assignment (or homework) to be?